University of Kentucky is a facility of higher learning located in Lexington, KY. This installation may be found in the Agricultural North Building. This picture was sent in by CS. 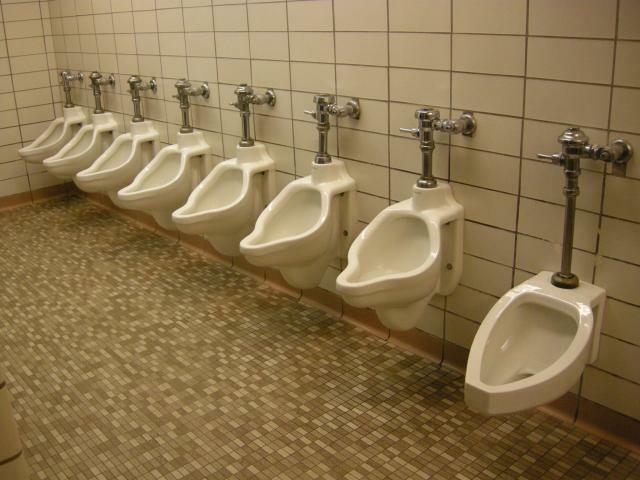 He writes: "Sir: Here is a picture of 8 urinals in a row, in the University of Kentucky Agricultural North Building (built in 1963, when peeing was apparently taken rather seriously). I cannot imagine all 8 have ever been used simultaneously! I have often though how neat it looked, and now realize that many others might, as well, with the recent discovery of your website. To keep your site interesting, how about posting this and challenging others to beat the current record of 8 in a row?"